Last weekend, we took a most amazing hike in the mountains just west of here. 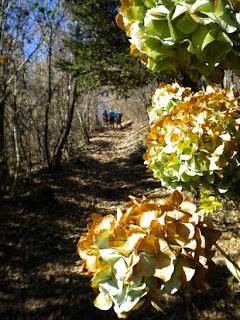 A small group of us set out early on a sunny Saturday to explore a new set of trails. 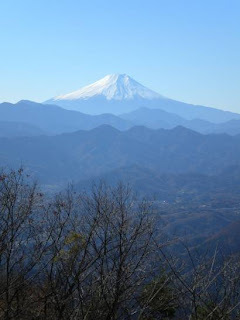 It was another glorious fall day - crisp, clear air full of sunlight - with fantastic views of Mount Fuji's snow-covered shoulders all the way out and along the trail to inspire us even more. 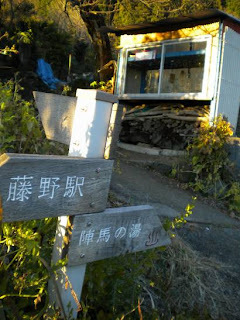 Our course took us up to a ridge and around to two peaks well west of Mount Takao - Mount Syoto and Mount Jimba - then looped us back down to the station. The trails were lovely, albeit steep in places, but Mount Fuji and glimpses of the Southern Alps in the far distance proved effective distractions. I hope to write the hike up here for anyone wishing to follow our trompings, and publish a few more photographs. I've got a bevy of projects in the hopper at the moment, though, so in the meantime I'll share what was the highlight for me. As a yasai otaku (serious vegetable geek), I am drawn to anything that looks remotely like a garden plot. So, I'm afraid I slowed our pace on the way up not just by being mildly out of shape, but because the small village we passed through on the way up to the ridge trail was a dream for me. 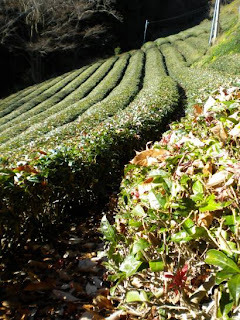 Tea fields scattered in every direction to catch the sun and show off their neatly trimmed tops. A few flowers were still in evidence as we passed, and more than a handful of seed pods like those I spotted at the Ebisu Farmers Market. Small plots of cabbage, wasabina, and a few other cold weather tolerant greens completely encased in monkey-stopping fencing dotted the places in between, but the real show-stoppers were the yuzu trees. Here in Tokyo my attention has been absorbed by the extraordinary beauty of the kaki as they sport their orange fruit in varying shapes and styles. Their flaming leaves have also stolen the show for me, although with a heavy rain late last week the trees mostly just hold the fruit like some kind of strange Christmas tree. Certainly, I've noticed some yuzu, mikan, and even a kinkan bush coming into color, but I hadn't thought much of it. Yet, on these mountainsides the trees were heavy with citrus, particularly yuzu. Yuzu is popular as a flavor for cooking, and the fruit themselves are plunked into baths to mark the solstice. I imagine those sunny little orbs cheerfully bobbing along as people chat in the tubs and rejoice that the daylight hours will slowly begin to lengthen. The smell of the fruit even without being cut brightens a room, and in the bath one can literally soak it right into your pores. It is yet another reason I am coming to adore the winter season in Japan. And here's another. Our descent from Mount Jimba to the bus stop took us again through a small village on the side of the mountain. As usual the steep sloping trail through the trees gave way to a thick stand of bamboo and then emerged in the bright sunlight at the top of the village. The narrow path suddenly became roughly paved, but much to our delight we found kiwi, yuzu, and tea fields lining both sides. 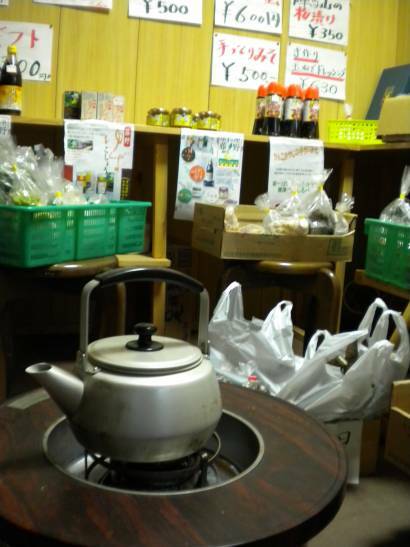 And to my great pleasure a vegetable stand offering big bags of kiwi, yuzu, and tea for prices beyond reasonable. Already dreaming of marmalade and kiwi in my morning oatmeal, our little group began filling our knapsacks. As we did so, the farmer arrived with fresh-picked yuzu in hand and started chatting with us as he restocked. The produce is all organic and he pointed to the tree just behind the stall to show where our yuzu got its start. As we finished loading up, he generously offered us more fruit and tea for our journey home. We tried to refuse knowing the amount of work it took to bring it to even that little stand, but he would hear none of it. A little further on we found a second stand offering homemade umeboshi in addition to the local fruits. Unable to resist, we loaded up on umeboshi and a couple more yuzu for good measure.This stand had sliding glass windows with a note (later translated by a friend) asking visitors to close the panels before the left to stop the monkeys from bothering. And sure enough, as we nibbled our umeboshi and carried on home we heard and saw monkeys in the orchards and forest on either side of the road. Charming for the tourist, but I am certain there is almost no charm for the farmer or gardener when the season's produce is by their romping and snacking. Just when we thought our bags could hold no more, we encountered a third vegetable hut near to overflowing with the seasons fare. A cooperative effort by local growers we found the days usual produce culprits joined by a variety of potatoes, ginger, togarashi (spicy Japanese peppers), miso, and assorted greens. If it wasn't so late, we would have stopped to warm our toes by the heater and sip cups of fresh green tea. Next time, it will be on the agenda for the day.